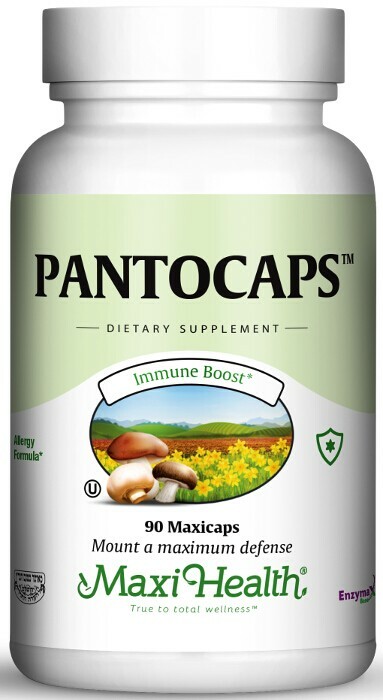 Pantocaps™ contains 500 mg of pantothenic acid in capsule form. It is more commonly known as vitamin B5, its part of the B-complex vitamins. It supports growth, reproduction, the synthesis of lipids, the production of steroids and neurotransmitters, and is a key to energy metabolism. It aids in supporting healthy serum lipid levels, energy, stress management and stamina. Try Maxi Health’s Pantocaps™ today. Take one (1) Maxicap™ daily, or as directed. Other Ingredients: Vegetable cellulose, vegetable magnesium stearate, Enzymax® (calcium carbonate, bromelain, papain, lipase, amylase, protease, silica). This product contains no animal products, wheat, soy, sugar, salt, yeast, gluten, milk, artificial flavors, colorings or preservatives.